It shouldn't come as a surprise that teens spend lots of time sending text messages, but it's interesting to see just how popular it is. While usage of the other communications methods have remained relatively steady since 2006, text message usage has doubled in the same period. 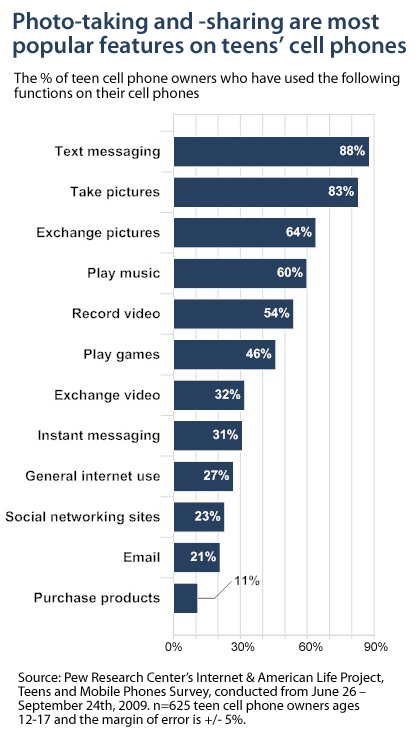 This data is contained in the fascinating new Teen & Mobile Phones study from the Pew Internet and American Life Project. 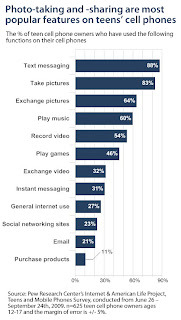 While teens use their phones for activities other than text messaging, it dominates the usage of the device and amazingly the average teen in the study sends an average of 50 text messages per day, and 31% report sending a staggering 100 or more messages per day. The monthly volume of text messages (357 for users of all ages) exceeds the volume of mobile phone calls which is only 204 based on data from The Nielsen Company. 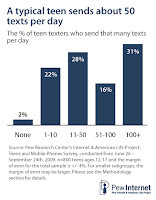 By contrast, teens between 13 and 17 years of age make only 231 mobile calls per month but send 1,742 text messages!